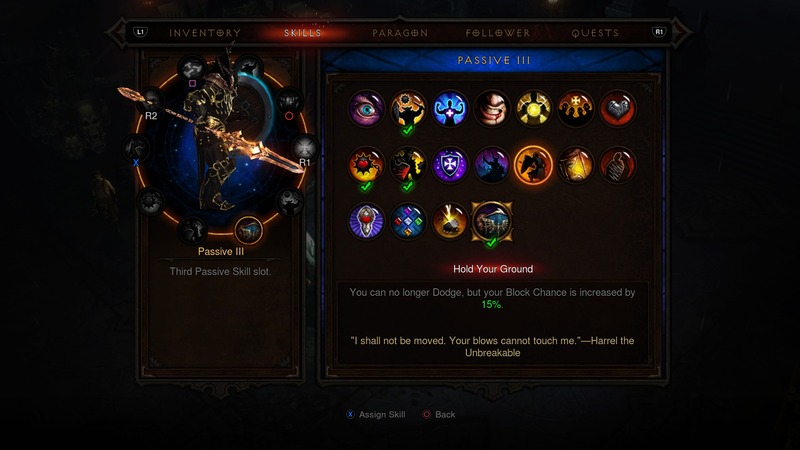 Diablo III Ultimate Evil Edition is one of the best games available on the PlayStation 4. It’s jam-packed with some of the most exceptional console-based dungeon crawling you can find, and is bursting with infinitely replayable monster-slaying action. It pulls players into a world of never-ending ARPG chaos, and is a shining example that Blizzard are the masters of their craft. The Ultimate Evil Edition comes with the original Diablo III game as well as its Reaper of Souls expansion–along with every game update that’s been released on PC so far (excluding patch 2.1). These updates bring new weapons, the Crusader class (who’s a powerhouse of awesomeness), an Artisan that can re-roll mods on items, and a brand new act that continues the story across the previously unvisited region of Westmarch. The franchise’s distinct action-RPG spirit has been furthered with this release, showing a dynamic evolution of the series while preserving its namesake mechanics, features and elements. Blizzard has found a way to ingeniously craft a worthy successor to the hallmark dark fantasy series with patches and updates that bring a smorgasboard of new features to the series. There’s a lot to explore in Blizzard’s newest entrant, so let’s start with the game mechanics. Elite bosses in Diablo 3 can get quite tough, especially in the Torment difficulties where their mod combinations are enhanced. The Ultimate Evil Edition keeps that same control scheme found in the previous console release. The in-game controls are fluid the point where it feels like Diablo was always meant to be a console game. Inventory and skill interfaces are comprised of radial menus that are a bit awkward to get used to, and can be navigated via the DS4’s touchpad. 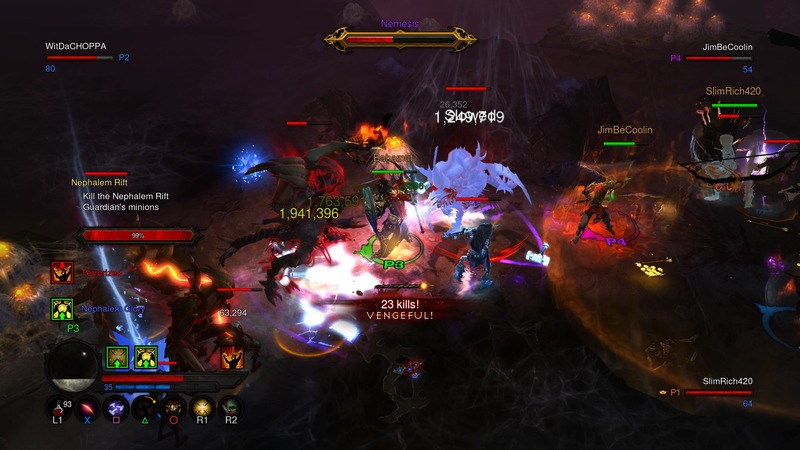 From the start, the game takes on an epic scope that fully taps the co-operative demon-slaying grind of the Diablo series. The seamless matchmaking system ensures players can team up with three other players on a whim and tackle everything from story quests to the new Adventure Mode. The Crusader is a flexible new character class added to the game who can easily perform multiple roles in battle. Their abilities are quite impressive and combined with the right gear they can be literal powerhouses on the field. The newly added Crusader class is one of the most versatile heroes I’ve seen in quite some time. The best way to describe them is a cross between a Barbarian and a Paladin from Diablo 2. Their skills are quite flexible; with Smite they can shoot long-ranged blasts of holy energy. With Blessed Hammer, they can be indomitable casters; and with Shield Bash and melee-based skills like Punish, they can dish out huge damage while becoming human shields. Crusaders even have activated auras called Laws that deliver bonuses to nearby players. Every skill also has its own rune sets to customize and experiment for the optimum build that suits your tastes. The Crusader’s passive traits are nothing short of amazing; Heavenly Strength allows them to equip a two-hander and a shield at the same time, and they have another called Indestructible that protects them from death. Crusaders are incredibly fun and serve as a breath of fresh air in all fronts. One of the most amazing things about the Ultimate Evil Edition is that it literally never ends. It has staggering meta-game content. 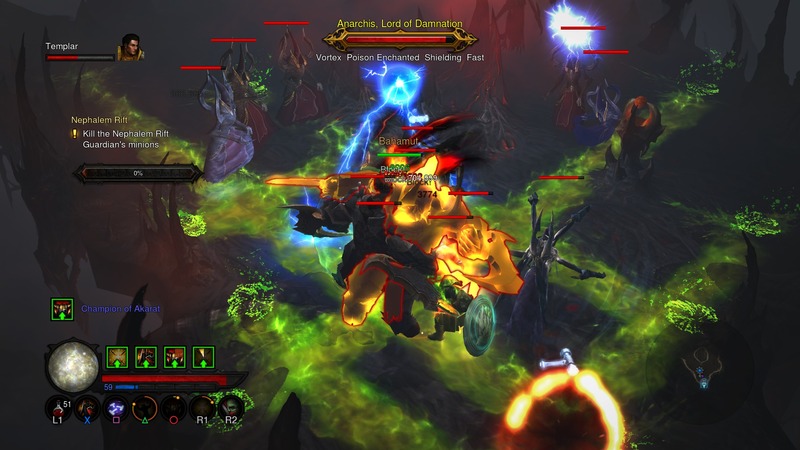 The limitless playability is largely due to new features like Adventure Mode, Paragon points, Nephalem Rifts, and six new dementedly challenging Torment difficulties. With Adventure Mode heroes can take on a series of randomized bounties that range from killing certain bosses to completing mini-events strewn throughout Sanctuary. The mode itself is completely separated from Story Mode and can be completed on all Acts, with every Act dropping its own cache of rewards. 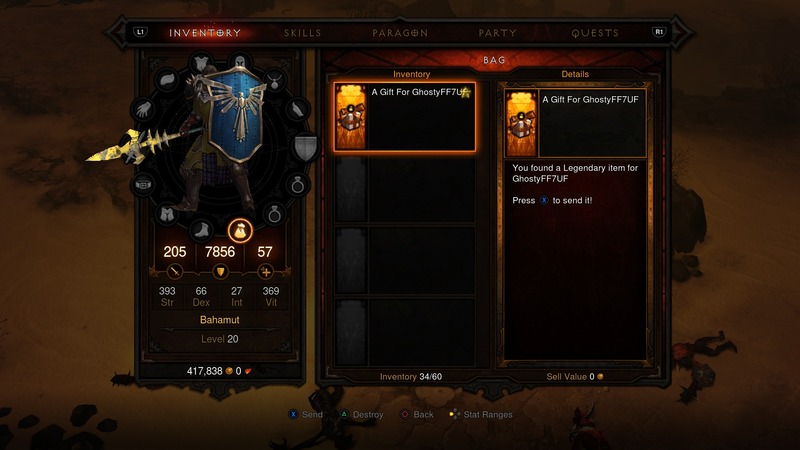 Adventure Mode seems to be more for end-game users trying to rack up their Paragon points, and offers a significant change of pace outside of the usual run-of-the-mill story questing. The best part about the gametype is that it perfectly captures the soul of ARPG’s by providing perpetual monster-hunting, and it’s something that Diablo always kind of had, except the quests weren’t randomized. 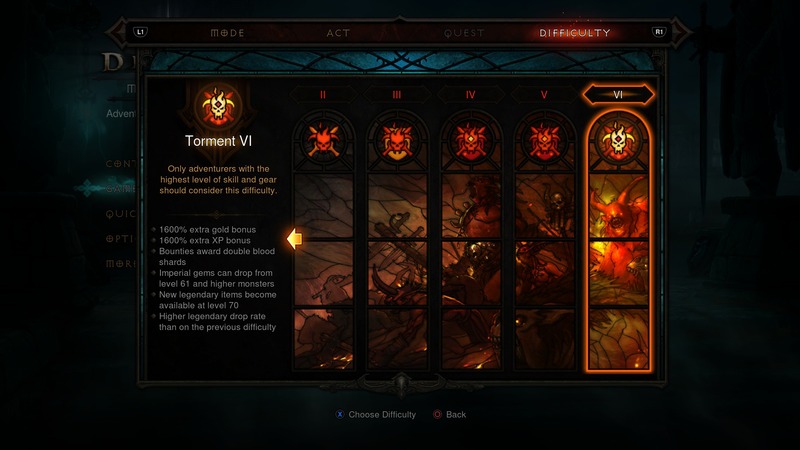 The Torment modes are largely responsible for the never-ending content in the game, powering Adventure Mode,Nephalem Rifts and the more advanced key hunting activities. The difficulty modes now affect gameplay even more. The Torment difficulties–which range from Torment I to the unbelivably sadistic Torment VI–are actually required to be able to find Legendaries on Level 70 characters. Torment not only adds more EXP bonuses and makes monsters all the more beefy, it also boosts the chance to find better items you wouldn’t be able to find in, say, Normal or Hard. These difficulties can be chosen for all modes including Story and Adventure. The advent of Torment and the accompanied modes brings a new important to co-operative play. Gamers now have to work together to tackle screenfuls of monsters in order to stay alive and continue their grind. You can even find gifts for your friends, which pretty much always translated to a leveled Legendary item. When a legendary item drops sometimes you’ll find a random gift for your friends. Gifts drop randomly, but often drop when you find a unique of your own, and ensures players share their identifying splendor with their friends. The gear itself is immensely varied, with a myriad of sets, legendaries and rares that fill up your chest in no time at all. Gamers can also break the max level cap with Paragon points. Essentially Paragon is a separate leveling system beyond Level 70 that provides passive bonuses for characters rather than new skills. There are four main attribute trees with bonuses that range from added Vitality, lowered resource cost rates, all resistances, and even movement speed. Paragon is infinite as well–I’ve personally seen some PC players hit 300 Paragon, so it doesn’t doesn’t stop until you do and has no ceiling. Nephalem Rifts are jam-packed with powerful bosses, making it a great place to magic find and level up Paragon points. Ontop of Adventure Mode we have Nephalem Rifts, which are portals to completely randomized areas with a single goal: annihilate every monster. These rifts contain a host of extremely powerful elites, some of which have devastating mods like Arcane Enchanted, Shielding, Extra Health and Vortex. The Nephalem Rifts have a massive frequency of these bosses, which of course translates the chance to find amazing loot. Tackling a rift on Torment III can lead to some pretty hefty Legendary drops. Every rift is also punctuated with a final Rift Guardian who will often drop some interesting items. All of these new modes guarantee that players will never have a dull moment in Sanctuary. There’s always something to do, always items to find and demons to slay–and you can always find a friend or ally to join up with. The Torment difficulties are perfectly designed to keep players moving forward, complimenting player progress with persistently challenging gameplay. No matter how strong you get, no matter what amazing items you find or skill combos you use, you’ll always be humbled by hordes of seething monstrosities. It doesn’t matter if you do 400k damage, have 1500 all resistances or have 20k Armor, your character will be tested–and will often die. This is the magic of this newly refined Diablo. Blizzard has tapped into an incredible equation that balances challenge and reward with seamless precision, and its mastery is evident the farther you venture into the heart of evil. In the Ultimate Evil Edition Players are empowered in a whole new way, but the game is very careful how it balances this power. Gear is largely responsible for any hero’s success in any ARPG, and once again Blizzard has one-upped itself by unleashing a new treasure-trove of shiny randomized goodies to the denizens of Sanctuary. Even with the immensely powerful Legendaries with their unbelievable mods–one two-handed polearm can even summon cows to your aid (yes, cows! )–it’s hard to find that perfect piece of gear. Sometimes that shield will have strength and vitality, but that crucial all resis or block-rate is all-but missing. 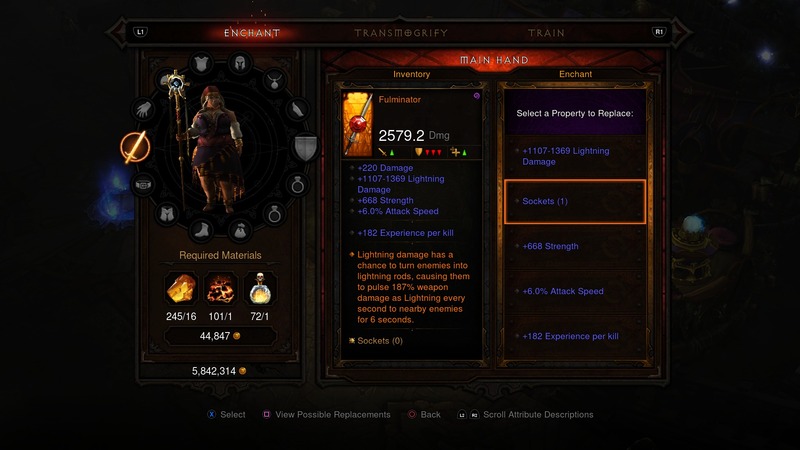 With the Artisan gamers can use enchanting to re-roll stats on all items. Now it’s possible to make that already amazing piece of gear into something 1337, godly, and all-around mind-mindbogglingly good. But there’s a catch: you can only re-roll a single stat on any given item, and there’s a chance you’ll get something you don’t want. Every stat is aligned in a series of pre-defined groups that differ from item-to-item. Some items, for example, can translate Life Per Kill into Strength or even Dexterity–raw stat boosts like these are crucial for any character–but others are limited. The items are quite varied but players will find gear that suits their character; as a Crusader, you’ll find shields and other gear that’s tailored to Strength and Vitality. Enchanting requires resources and gold, so you won’t be able to switch around the mods as often as you’d like. Rolling high-tier Level 70 Legendaries, for example, costs a pretty penny by requiring Forgotten Souls, which aren’t dropped to frequently. Resources like Forgotten Souls can be acquired by salvaging Legendary (and rare/magical) items at the Blacksmith. Enchanting and crafting via the blacksmith adds in a new level of depth to the usual Diablo grind. Since there’s always a new difficulty mode to traverse and tough baddies to slay in Adventure Mode and Nephalem Rifts, gamers will always be searching for better equipment to fuel their quests. 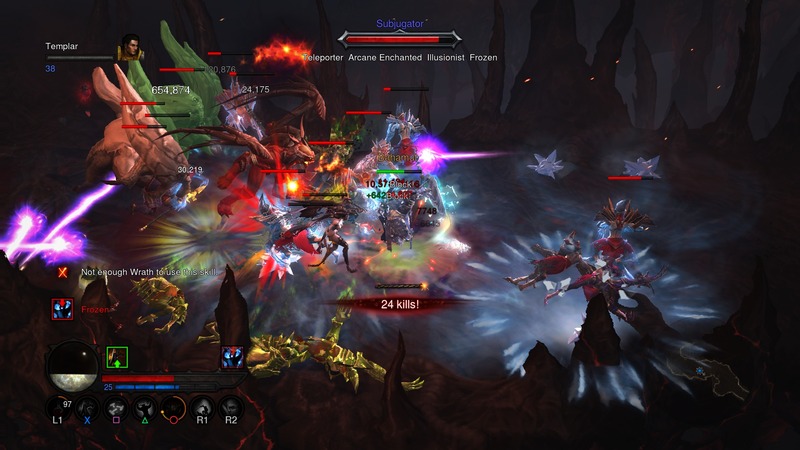 Teaming up with other players is an essential part of any Diablo game, and is moreso important for this version as monsters can become quite bloodthirsty. Now players are not only searching for top-tier gear, but to find resources to re-roll items and gems to slot into their helms, plates or titanic battle-axes. Gems have gotten a nice boost as well, with a host of new grades as well as the inclusion of the diamond. Diamonds give all resistances in shields and armor, which is undeniably crucial for modes like Torment. 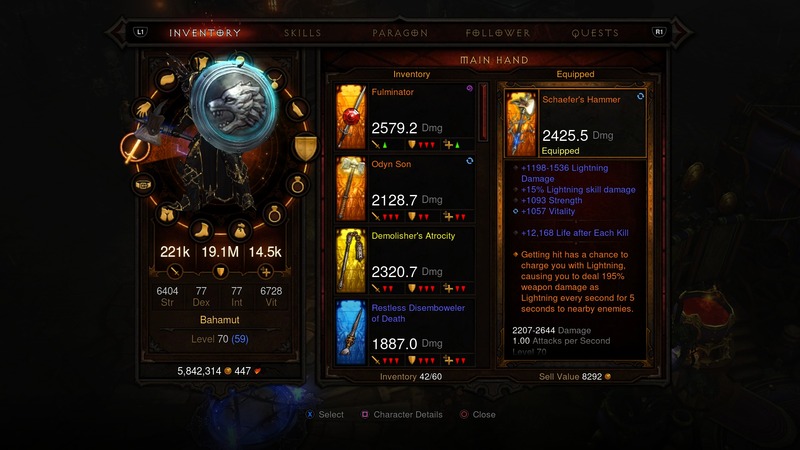 The huge addition of content has significantly evolved Diablo‘s end-game structure. Endgame is now less about killing monsters but choosing the right kinds of items with certain stats. This becomes the major turning point for all characters and stands as the major trial to progression. You’ll find items that are good, but they lack certain stats and must be scrapped for resources. Juggling gear is a tedious but interesting aspect of the game, as you’ll often experiment with new skills and abilities to keep things fresh. Nephalem Rifts and Adventure Mode add in a massive amount of replay value for the game, as every single session can last for hours and only end when you call it quits. If you needed even more extra content, Blizzard has brought back the Ubers for some of the most challenging end-game content in any Diablo game. Players can open up special portals to battle royales that actually pit gamers against up to three bosses at once in an extremely tough, heart-pumping fight. 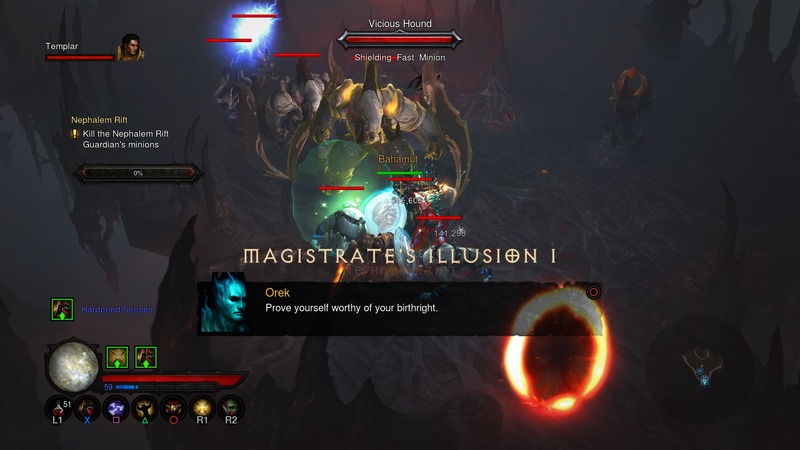 For the Realm of Fright, for example, a friend and I fought Magdha, Diablo and the Siegebreaker all at once–and Diablo even split himself into three different versions. It was intense and incredibly fun, serving as one of the more entertaining bits of semi-hidden content I’ve see in the entire game. The Uber fights are intense and pit players up to three different bosses at the same time. To get to these portals, you’ll need to find the plans to make an Infernal Machine, and the keys associated with each. There are four machines for four different boss battles. The keys and plans are dropped by Keywardens, which spawn randomly in specific areas. At the end of the Uber bossfights, the player who opened the portal gets an organ–in this case the Heart of Evil–and all four organs are used to craft a Hellfire Rings and Amulets, one of the most prestigious and powerful items in the game. This extra bit of content is extremely fun and enjoyable, and serves as a way to test your mettle. Be forewarned, though, it’s quite hard, so I’d recommend trying it out in the lesser Torment difficulties. 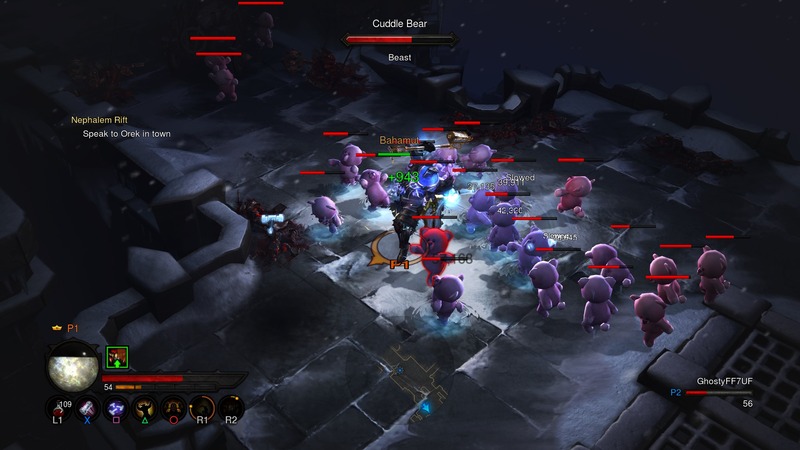 The game isn’t without it’s humorous charm, though: baddies like Cuddlebears and Twinkleroots can be randomly generated in the Rifts. The Diablo III: Ultimate Evil Edition is undoubtedly the definitive console port of the franchise. Blizzard has redeemed the series with an unprecedented level of action RPG mastery, proving that they’re on their game by reaffirming their commitment to the brand. Despite some grievances like clumsy boss battle prompts and the tedium of constantly having to compare found items to equipped gear, the game outshines every other console dungeon crawler on the market. Blizzard has created a game where there’s always something to do, always something to slay or make or find–they’ve built a never-ending adventure that only gets better with time and never gets stale. The in-game music is stupendous, and the graphics and environments really instill the unending war between good and evil in a superlative way. The new content is so rich and expansive that it really feels like a brand new game, and Blizzard has confirmed that the console versions will be getting regular updates to match its PC counterpart. With that level of determination, Diablo III will continue to evolve and take on new shapes in the months to come, proving that it’s the ultimate choice in the ARPG realm. Will Samsung's Gear Live Change Your Opinion On Smartwatches?